All UK train companies join Southern in having constant strikes over guards - why are British trains so bad? Update: This article was originally written about Southern Rail, who had a disasterous 2016. Since then, many other UK train companies, including the brand new South Western Railway, Merseyrail, Northern and Greater Anglia have decided to copy them. Although this article was written about Southern, you can say the same about all these companies. I'm not an expert on railways. I'm not employed by them. But I do know a little bit about how they work, and in a rare serious post, I thought I should provide an amateur's explanation as to why Southern Rail have had such a bad year since 2015. This is not intended to be an official explanation, but is trying to provide some background knowledge for those who've had to suffer horrendous delays. I also do not work for Southern or its parent company as a striker or manager - I'm just interested in how it has gone wrong. Most train routes in the UK are grouped together and awarded as franchises. Every few years big companies must state how much money they want the government to give in return for running that region's trains, as well as explaining how they reached that figure. Although the government will claim they award it to the firm who offer the best deal, the inevitable truth is it goes to the lowest bidder. It's the public's money after all, and as we know, the UK doesn't have a lot of money to throw around. In 2014, First Capital Connect and Southern were merged, and a new round of bids was opened for what was now the largest rail franchise in the UK. There were warnings that major engineering works would make this franchise difficult to run. Govia Thameslink Railway won the bid and decided to operate the services as Southern, Thameslink and Great Northern. One of their justifications which allowed them to win the bid was that Govia Thameslink Railway would increase the number of trains running without a guard, known as Driver Only Operation (DOO). This allowed them to submit a lower bid. In 2016, GTR began a plan to change the role of guards from traditional conductors to roving customer service officers. "Customer service" is a bit of a buzz-word on the railway at the moment. The idea is that customers like having people around to help them, but the number of customers needing help is dropping. Having staff tied to particular jobs - ticket office clerks or cleaners - means they won't be flexible enough to help everyone who needs them. Customer service staff do save money and, as we'll explain later, this is important. Southern's argument is that when guards are helping customers or selling tickets, they often have to interrupt themselves so they can go and open the doors, and this looks unprofessional. The only actual change brought about by this change in job title is that the driver will now open and close the doors (as they are already doing on existing DOO services). They talk a lot of sense. However, knowing that their jobs are under threat, guards feel that allowing this is moving a step closer to them being made redundant. They are probably right: if you take away all their important tasks, that person becomes ripe for redundancy at the next opportunity. While at the moment Southern say no jobs will be lost, that doesn't mean staff who do leave will be replaced - and if your colleagues leave and aren't replaced, it's only a matter of time before managers ask whether you need to stay either. In summary, both sides have got it spot on - and that's why the situation has deteriorated to strikes. Of course, it's not just the frequency of the strikes which have been frustrating customers: many say strike days have been the most predictable commutes they've had. The transport industry relies on employee goodwill. Timetables change and employees will leave with only one months notice, but it will take at least six months to train up a new train guard or driver. To make sure they don't over-staff and pay employees to sit around doing nothing, the rail and bus industries instead under-staff and rely on overtime to get them through the normal working week. It works: transport employees will usually tell you the best thing about their job is they can work all the overtime they like. However, once things turn sour, it all falls apart. There have been rumours of an unofficial overtime ban at Southern, but whether that is true or not, if you hate your manager and hate your job you are unlikely to work any overtime. You are also likely to call sick at the slightest chance, and find there's no-one wanting to come in and cover you. Southern have been left with huge staff shortages. That's not the only employee goodwill which has been lacking. Another peculiarity about the transport industry is that if your train leaves at 06:00, you will be paid from (for example) 05:55. However, the walk from the office where you sign in to your train might take 10 minutes (trains are long and take ages to walk around). That's before you do all your mandatory safety checks. Under normal working, this works surprisingly well. Staff don't mind turning up 10 minutes early if they love every other part of the job (and if they'll be doing 15 hours of well-paid overtime later that week). But the moment things turn sour, staff suddenly start deciding they aren't going to leave the office until the pay starts. So suddenly the staff aren't getting to the 06:00 train until 06:05. The more brazen staff, but certainly not all, may decide it's safe to stay for another biscuit too - let's be honest, if you hated your manager, wouldn't you? This is a vicious circle: the more the trains are late, the more the guards hate having to do their job (as they take all the stick for it). But the more they hate their job, the less hard some of them work and the later the trains get. Trains run as part of a network. It sounds obvious, but the system is dependent on everything being in the right place at the right time. That five minute delay we discussed earlier may cause another train to miss its slot. Multiply this across a busy day and you end up with a network of trains all having to make it up as they go along, delaying each other as they go. It easily turns into a mess. There have been reports of various administrative errors being made. I have sympathy with the clerical staff here. When everything is hitting the fan, human instinct is to turn on each other. Even if you're in a safe and warm office, it can't be easy working for a company you know are terrible, and one where you know if you make the slightest mistake, the angry public will jump on it. Delays due to a train being parked in the wrong place or a member of staff being given the wrong shift are embarrassing but are inevitable when you have a company in crisis. Is Driver Only Operation/Customer Hosts A Good Idea? As ever, I can see both sides of this argument. We all know train tickets are expensive - and those prices are only going to go up. The industry needs to keep those prices as low as possible. Most commuters will tell you they use the train every day and rarely see the guard do anything useful: everyone seems to have train tickets (often checked by an electronic gate at the station) and nobody needs staff help. The London Underground and Overground have proven a dense and extremely busy railway can run without any guards at all. The Overground is very similar to the suburban parts of the National Rail network. But wait! Trains run at up to 140mph, and frequently carry 1200 people. They regularly hit things: collisions with people are depressingly common, also animals, and there will be passengers who get taken ill and need assistance. Considering how many trains run in the UK, none of these events are very common, but they do happen and a train driver on their own cannot safely keep control of all those agitated people on board. Let's get more explicit about this. I have never had to witness a person be hit by a train, but I have spoken to a driver about it, and I won't repeat his graphic, harrowing explanation of what it's like to get three seconds notice that a troubled, living being is about to explode across your windscreen. It is mortifying. When there is an emergency, passengers have a tendency to take matters into their own hands, and most of them don't know what they're doing. They will scream, walk around the tracks, look for somebody to have a go at (yes - whenever a person jumps in front of a train, hundreds of people will complain that the train company is making them late). By taking away the guard, we are telling the train driver they need to be involved in a fatality, not be upset or shocked by it, report the incident, and then remain professional in front of 1200 of those angry and uncontrollable passengers, while keeping in contact with your controller. This is a terrifying amount of pressure and it is not going to go well. In summary: guards rarely do anything really important (I mean REALLY important), but when they do they are invaluable. Do we save the money on their wages and take the risk that we can live without them? I'm not sure. 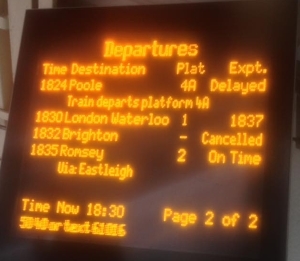 But why are all UK trains so bad? They are. And while I used to detail it all here, I've moved it to a new page.